that tiny photographer: Welcome to the family. I thought today was the appropriate day to break my cycle of procrastination and publish this post about my new niece. Towards the end of August, my brother called me. My phone is typically on silent or on it's last bit of juice. So, the call rolled to voicemail and Kyle asked me to call him when I got a moment. I plugged my phone in and rang him up, fully expecting him to talk about some detail for an upcoming playdate. The minute he said hello, my heart started beating a little faster. He and his wife have been waiting for an adoption referral for over a year. They have a little boy, Rogi, who they brought home from Ethiopia in 2011. This process has been a bit different, though, because they are adopting domestically. Kyle told me that they had just received a call for a little girl only a week old who was in the NICU at St. Francis and that after thought and prayer, they were going to accept the referral. They expected to bring her home within the week. 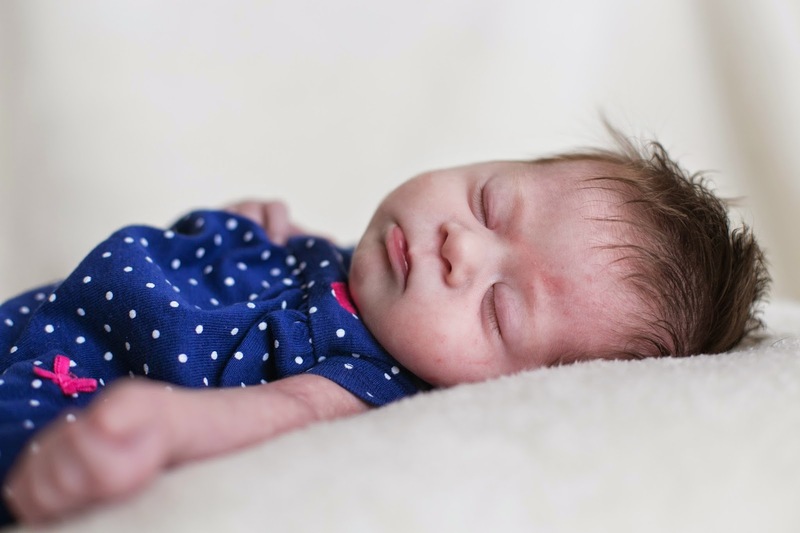 The next day, I was invited to come and meet my new, very sweet niece, Katie Abigail. She was so little, a full two plus pounds smaller than any of my newborns. But, she had loads of soft, brown hair. I'm so happy to have her in our family, but late that night as I was telling Stephen about my visit, I cried for her. You know, I went to Ethiopia with Emily to pick Rogi up. By that point, Rogi was big and chunky and nine months separated him from the moment his birth mother walked away. But here was newborn, little Katie, and the whole of her situation just felt really fresh and raw. So I cried for all she was losing, and for all the hard things she had experienced in her few days. But I also cried for what she was gaining, a family that will wholeheartedly cherish her life. Funny little side story. Katie has Downs Syndrome. 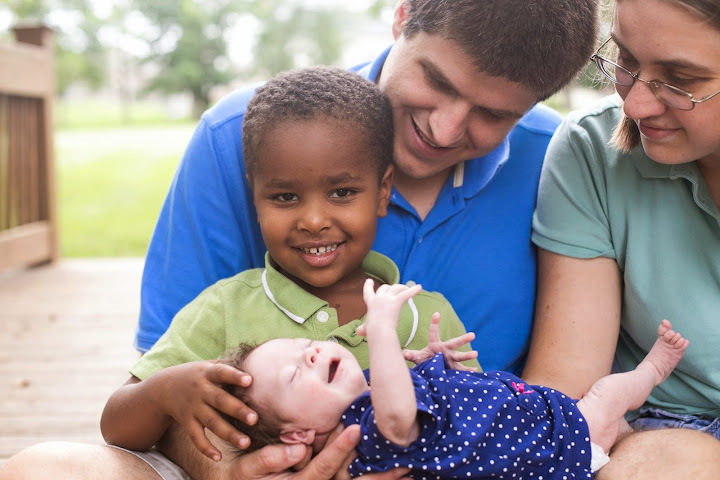 Kyle was quickly connected with a lady who attends his church who also has two kids with Downs. Kyle shared a little about Katie, and Tara was surprised to realize that she already knew about this baby. 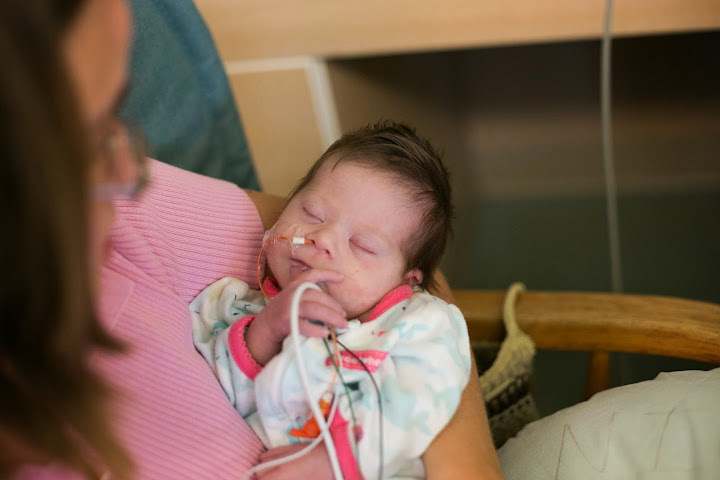 A friend of Tara's also had a baby in St. Francis NICU, saw that this baby was going to be placed for adoption, and asked Tara to pray for her. Kyle was telling me about Tara and this little story and he asked, "I saw you were friends with Tara on Facebook. How do you know her?" Tara and I both attended the same church in years past. I had just suggested her to speak at our MOPS group on how we can support mom's with special needs kids. I also realized that I knew the lady, Cyndy, who's baby was in the NICU. These little coincidences are significant to me. I just have a sense that baby Katie was surrounded by friends early on. She was being cared about even before Kyle and Emily were notified she existed. I've got to brag on my brother and his wife for a minute. The adoption agency thought about them specifically when Katie's case came up. They hadn't set out to adopt a baby with Downs Syndrome. They just wanted another baby to love, care for, and raise. 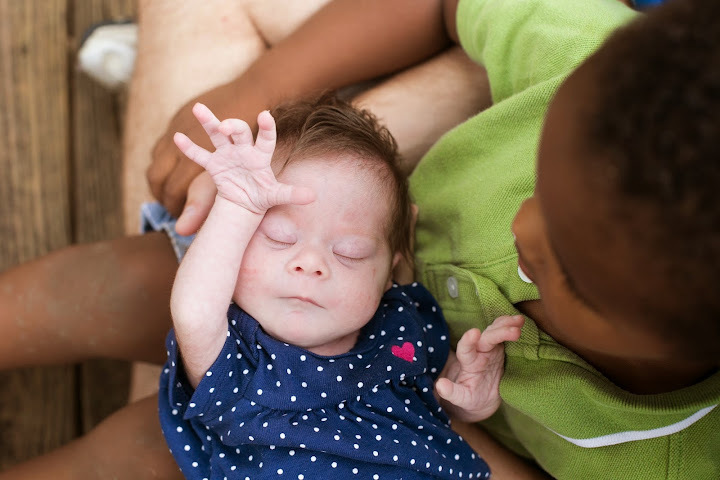 A baby to fill their home and their hearts, and they were able to recognize that Katie's Downs Syndrome didn't disqualify her from being that baby. I don't want to romanticize their decision too much. Adoption is hard and hard work. Tara spoke at our MOPS meeting a couple of weeks ago, and she made it clear that parents with special needs kids aren't super parents. They'll probably have doubts and plenty of discouraging days. They'll need lots of encouragement and support. But...I'm super proud of them for being willing to do this hard, valuable work and for holding the crazy belief that the their life will be better for it. Today, they hauled their sick family down to the courtroom to make it official. So now she is legally Katie Abigail Clark. Welcome to the family.